Our challenge to readers to provide proof of the ultimate bacon sarnie looks set to provoke even more controversy than the matter of the zenith of sliced pork/bread assemblages has already caused. In case you've missed the porcine polemic, our Bauernfrühstück versus bacon sarnie post-pub nosh deathmatch had experts up in arms as they claimed definitive wisdom in the matter as to just what constitutes the pinnacle of pork perfection. Accordingly, we threw down the gauntlet for them to provide photographic proof. Sadly, many of you took this as your cue to launch into yet more verbals, without actually putting your money where your evidently ample and salivating mouths are. You've still got until Friday to get your entries to me right here, so get your acts together. 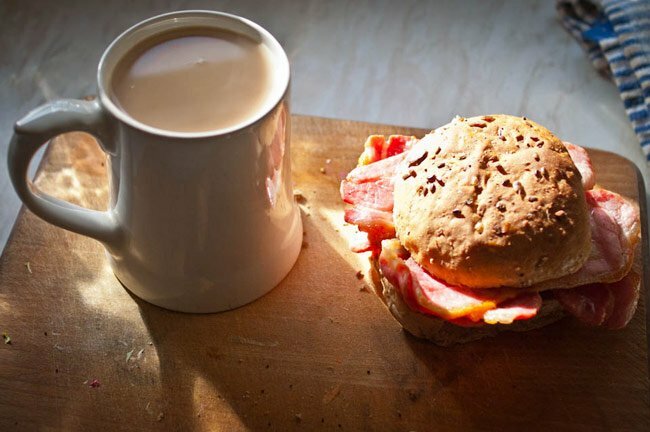 Yes, that's right: this thing they call a "bap" is "seed strewn" and "wholemeal", in direct contravention of the "Thou shalt use only hand-sliced white bread, for it is the Lord's will" bacon sarnie commandment. Bruce has, however, deployed butter and says that in the matter of the quality of bacon used, it should simply be of high quality and in abundance. He also notes that any bacon sarnie "must be served with a giant mug of tea". This is "elevated from refreshing but basic hot beverage to nectar of the gods by simple application of: 1) any greasy food, in this case the bacon butty and 2) several pints too many of one's favourite ale (porter for me, Orkney Dark Island if it's on the go), the last of which having been imbibed approximately 10 hours previously". Well, we won't boycott it, OK? Does that count?